Rated 5 out of 5 stars by 10 PRO members. 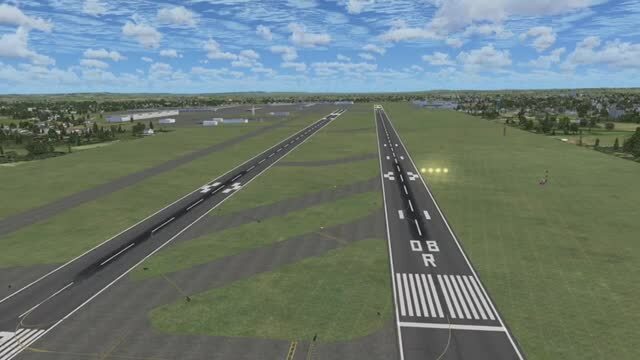 These new textures for FSX enhance your default ground airport textures. This package contains all new high detailed taxiway textures, ground textures, and all new taxiway line textures. The new ground textures give a more realistic illusion of rocks, grass, etc. Autogen as well as taxiways, will now look more realistic and "in place"since they are no longer over a low resolution detail 1.bmp file. The new taxiway line textures ( or taxilines as I call them) make your default taxilines look even more realistic. Now you will see environmental weathering effects such as cracks and holes on the taxiline paint. And finally, the new taxiway textures upgrade the default FSX ones. Every detail, crack, and pebble was carefully analyzed and created with the aid of hi-res sources. And place them into your C:\Program Files\Microsoft Games\Microsoft Flight Simulator X\Texture folder. Click yes to overwrite,Now take the detail 1 bmp file, and place it in your C:\Program Files\Microsoft Games\Microsoft Flight Simulator X\Scenery\World\Texture folder. Click yes to overwrite. Thats it! Run FSX and go to any airport of your choice. You may re-upload these textures to another site of your choice, as long as my name is stated as the original author. Do not attempt to remodify or edit these textures. The archive FSXGrnd_Tex.zip has 22 files and directories contained within it. Like any shallow individual, I always look for ways that I can tip the balance between performance and graphical quality. I don’t mind losing a few frames every now and then if it makes everything else absolutely shine, and I was a bit disappointed to see that my main PC was capable of running FSX with all of its bells and whistles at the very maximum with complete performance, too. Whilst this might sound like a ridiculous complaint, my issue was more with the fact that at full throttle everything still felt unpolished to me. I’ve taken several swipes at the FSX graphical quality in the past, but it’s more just because you can see how much potential is lying untouched by the base engine when you use community mods. For example, this mod itself is the perfect way to spice things up and give yourself a game that looks how it should. This adds new ground textures to airports and removes that bland texture that fills up most of the world airports and instead replaces it with something far more detailed and authentic – it makes airports far more fun to be in and around rather than feeling like a rather uninteresting concrete jungle. Having the ground looking as realistic and impressive as the actual aircraft that you are flying is vital to making sure that the full picture and story is told; what’s the point in flying an impressive, HD aircraft in a world where everything looks really smudged? With the help of these brilliant mods, though, you can put this problem to bed and create a far greater balance between the overall picture that FSX sells you. Instead of feeling grossly out of balance and touch, FSX airport ground texture upgrades can be the way to make everything look a bit more realistic once again. Realism is vital for anyone who wishes to see a flight simulator that replicates the feelings and emotions of the real thing – if you can’t get that genuine excitement and fear, even just for a few seconds, then it’s not real enough for you. It has to feel authentic otherwise there really is little point in taking part – this is what simple mods such as this can bring to the game. When the airport you are flying out of feels as if it’s a key part in the journey you are about to make instead of an afterthought, it’s much easier to enjoy yourself when flying an aircraft such as this. It’s got everything that you could possibly need, really – it’s got the quality down in terms of the aircrafts visuals, and its performances match up to what I was l hoping for. You won’t notice any performance drops like we were speaking about at the start – instead, you shouldn’t even notice any changes in performance despite the rather massive increase in the textures that you have made. So what are you waiting for? Stop looking at the fake ground and change it up right away – I cannot recommend this absolute game-changer enough. Very nice package, adds great scenery to the ground when I taxi and land, and looks realistic compared to looking at the ground at airports put of a window during taxi, takeoff, and landing. I love these textures, but there's one thing that bugs me. IT seems as though the turns are still default taxiway lines. I dont know if this is because I installed it wrong or something, but i think i did it correctly. Thanks for the awesome textures. Thanks! Improves the overall ground experience and makes everything much more real. Worth it! It did improve the ground scenery at airports, but after I added this add-on, there were a lot of cracks where in real life there aren`t any in that spot. However, it made most airports more realistic, and the rest of it, no problem. Gamalier Padilla made it simple. I will be look for more of his work. This all new scenery recreates a very exclusive quality while running Flight Simulator. It do works absolutely fine without no game-error. I recommend this for every simmer. nice job really adds to the runways!